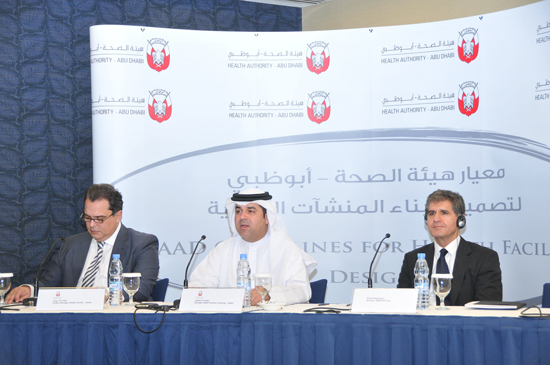 HAAD – The Department of Health Abu Dhabi, which regulates the health care sector in the Emirate of Abu Dhabi, provides “Healthcare Facility Design Standards” for the Emirate of Abu Dhabi. These HAAD Health Facility Guidelines (HAAD HFG’s) are available for viewing online at: healthdesign.com.au/haad.hfg. TAHPI is considered the global expert in the implementation of Health Facility Guidelines in any Health Facility project, and has been involved with the creation of Health Facility Design Standards in collaboration with health authorities from across the world. With hundreds of successfully completed projects TAHPI provides clients confidence that they will comply with local Health Facility Guidelines in Aubu Dhabi, Dubai, the UAE, and now internationally. The HAAD Health Facility Guidelines set the requirements for health facility design and construction as well as the prequalification of healthcare design consultants in Abu Dhabi. The standards are a comprehensive tool that all future Healthcare facilities as well as currently refurbished ones need to comply with to be licensed. All Healthcare design consultants who wish to design and submit projects for licensing applications will need to be pre-qualified in accordance with the standards. Owners and operators of Healthcare facilities will need to be familiar with the standards as they engage consultants and embark on new projects. The standards provide in-depth information and ready-to-use standard components for the briefing and design of healthcare facilities at no cost. The standards will be used for the evaluation of applications for Healthcare Facility Licensing as well as Inspections. Some pre-existing International Standards have been referenced in these standards, however, the specific and unique requirements over-ride any other standards. The standards have been prepared by a team of specialists, drawing on their experience in creating such standards as well as information from around the world with specific customisation for the UAE. These are amongst the most detailed and comprehensive standards of their kind in the world. Aladin Niazmand, Global Director of TAHPI, Health Facility Planning Specialist, said: The HAAD Health Facility Guidelines place emphasis on achieving Health Facilities that reflect current health care functions and procedures in a safe and appropriate environment. They represent patient focused, research based, modern and efficient planning principles. The standards provide invaluable knowledge in the most specialised area of Healthcare Briefing, Design and Construction. It is more than the typical proscriptive building regulation. It educates and guides, provides terminology and tools, offers ready-made standard components, encourages further innovation and It is locally aware and regionally sensitive. The HAAD health facility standards are available through the HAAD website www.haad.ae/hfg. The standards will be periodically reviewed and updated to respond to new operational models of healthcare, technology and public expectation. The HFBS (Health Facility Briefing System) offers access to the HAAD Health Facility Guidelines (HAAD HFG’s) and can be used to rapidly brief a health facility using these standards and more, for more information on this please check the HFBS article on the Abu Dhabi Health Facility Guidelines.